I have always been a fan of freezer friendly meals. On busy nights, there is nothing better than being able to pull a homemade meal out of the freezer and simply heat it up. With a new baby on the way, I have started spending my weekends cooking and freezing meals and treats for those busy days and long nights ahead. 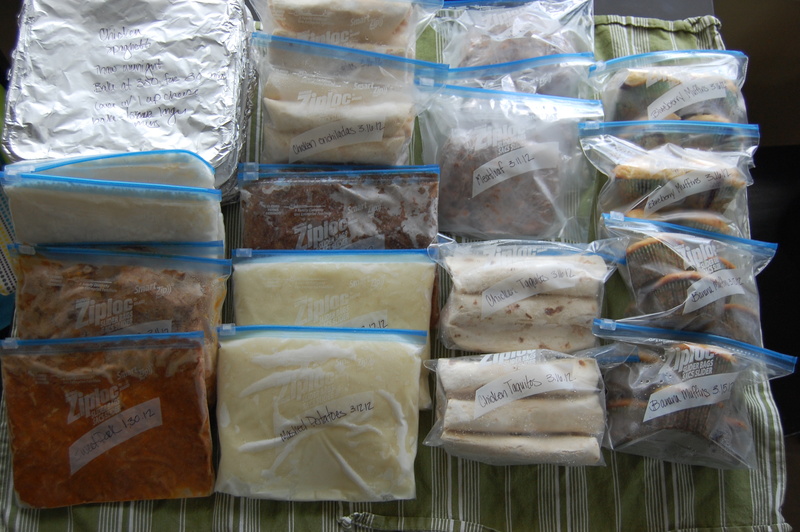 I prefer to freeze meals that are precooked and simply need to be reheated before serving. One meal that I have found freezes and reheats very well is Slow Cooker Apricot Chicken. It is a recipe that is easy to double and is also something that my whole family enjoys. I also like to make a large batch of rice and freeze in individual bags to serve alongside the chicken. That way, all I need to do is take about 10 minutes to reheat and make a vegetable or whip up a quick salad. Another meal that I have found freezes well is meatloaf. I prefer to make smaller meatloaves that are just the right size for dinner for my family. You can really use any meatloaf recipe that you like, but my favorite is a very basic meatloaf with a hint of a surprising ingredient – brown sugar! This recipe can also easily be doubled. Mix all of the ingredients together in a bowl, leaving out the ground beef. Add the meat and mix with your hands until just combined. On a foil lined cookie sheet, shape the meat into 2 medium size loaves. Bake at 350 or for about 45-55 minutes until fully cooked. Top with ketchup for the last 10 minutes of cooking if desired. Let the meatloaves cool and then wrap them in surran wrap, place them in a freezer safe bag and stick them in the freezer. 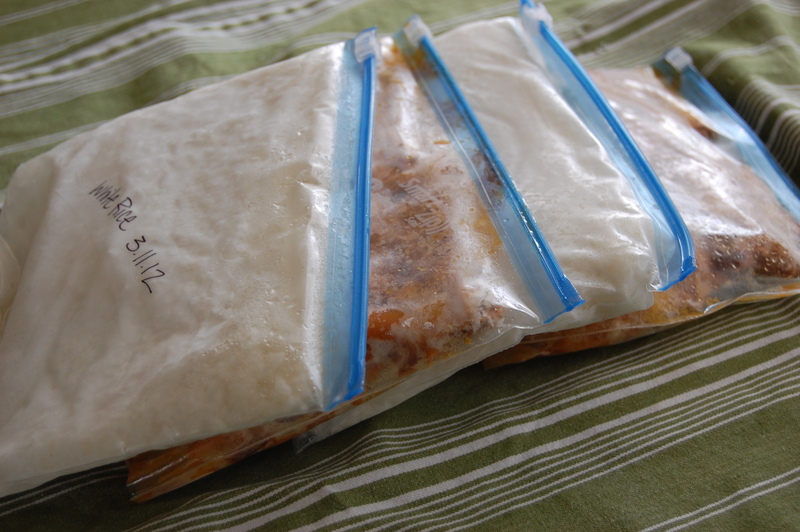 When I am ready to use, I just thaw them overnight in the refrigerator and then reheat in the microwave or oven. 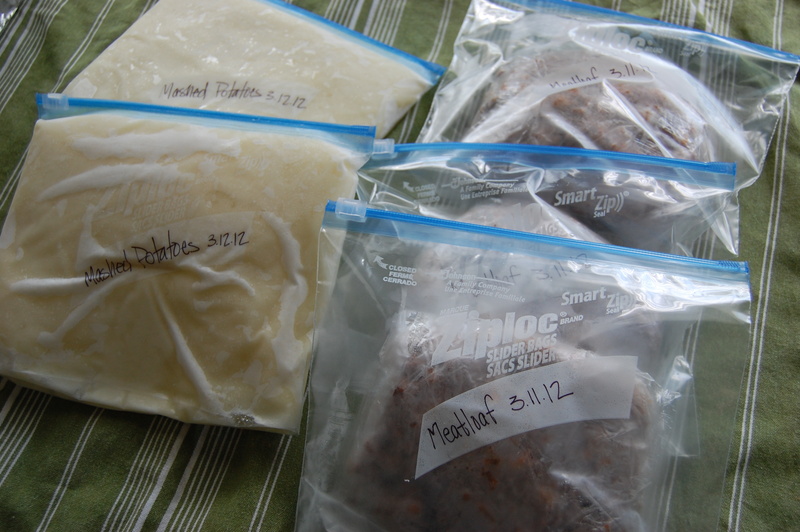 I like to freeze mashed potatoes in separate bags for a quick and easy side. Again, just thaw overnight or pull right out of the freezer and reheat! With a little planning, I was able to prepare 6 full meals for busy days ahead. Next time you are taking time to cook a meal, considering doubling the recipe and freezing the leftovers for another day. It is a small step that can save you a lot of time. Stay tuned for other freezer friendly recipes!